The Gulf Centre for Human Rights, the Bahrain Centre for Human Rights and Cairo Institute for Human Rights Studies hold the authorities in Bahrain full responsibility for the life and safety of human Rights defender Nabeel Rajab. The President of Gulf Centre for Human Rights (GCHR) and Bahrain Centre for Human Rights (BCHR) Nabeel Rajab was beaten severely by the security forces in Bahrain then moved in an ambulance to Salmaniya hospital after participating in a peaceful protest in Manama earlier tonight. He has told his lawyer on a phone call following the attack that the policemen gathered around him suddenly and started to beat him. He informed the lawyer that while lying on the ground he was beaten all over his body and specially on his back and face and that his face injuries are serious. He has an injury just below his right eye. He was then taken to Salmanyia hospital which is still controlled by a heavy security presence since last March. Human rights activists from Bahrain Youth Society for Human Rights (BYSHR) and his lawyer Mohammed Al-Jishi who have headed immediately to the hospital were prevented from seeing him. His Son Adam Rajab saw his dad in the hospital, carried by police, he said Nabeel’s face was swollen. When Adam tried to take a picture of his dad he got pushed and his phone was taken from him. Dr Alaa AlShehabi reported from the hospital that Nabeel is surrounded by 8-10 security officers and that he is suffering from concussion, back pain and bruises to his back and face. He told Dr Alaa that he was attacked by a group of police officers with sticks, he was kicked, punched & beaten all over his body and especially on the face. BCHR member Said Yousif AlMahafdha was able to see Nabeel for a moment by was then asked by Minister of interior officers to leave immediately. BCHR knew that Nabeel is being interrogated right now, though he can’t talk and is currently on a wheel chair. His family was not allowed to stay with him. Following the same attack, Sayed Yousif AlMahafdha, active member of the BCHR, was also injured with a stun grenade in his leg and arm. In addition, supporters gathered in solidarity outside Nabeel’s house in Bani-Jamra were attacked with tear gas. This is an urgent appeal, the fact that the ministry of interior is controlling access to Nabeel with heavy security presence around him and preventing taking photos is very worrying and we are concerned about his health and life. Rajab is believed to be under arrest, until authorities with the Ministry of Interior allow visitation or reveal Mr. Rajab’s status. There is an imminent fear of torture, in case Rajab was transferred to a detention facility, particularly that there is a trend of targeting human right defenders in Bahrain, who are frequently subjected to torture and other ill treatment while in detention. 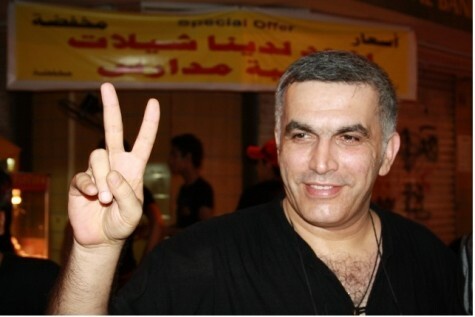 GCHR, BCHR and CIHRS believe that the security forces attack on human rights defender Nabeel Rajab is directly related to his legitimate work in defense of human rights and democracy in Bahrain. We are deeply concerned that this latest attack comes as part of an increasingly hostile environment that human rights defenders in Bahrain are facing which has included the repression of peaceful demonstrations in the villages of Bahrain, the arbitrary arrest of nonviolent protesters on daily basis, and the attacks and intimidation of human rights defenders who are defending the people’s rights in Bahrain. We condemn in the strongest possible term this vicious attack on a well known human rights figure inside Bahrain and on the regional and international levels. GCHR, BCHR and CIHRS, are gravely concerned for the physical and psychological integrity of Nabeel Rajab and hold the government of Bahrain responsible for his safety. Human rights defender Nabeel Rajab has left the hospital going back home after getting the required treatment during which he was interrogated by the security forces. The Gulf Centre for Human Rights is an independent centre and has been registered in Ireland. The Centre works to strengthen support for human rights defenders and independent journalists in Bahrain, Iraq, Kuwait, Oman, Qatar, Saudi Arabia, United Arab Emirates and Yemen.